At 28, I looked haggard, tired and had prominent eye bags – yes, the picture of me from 2009 is with make up. I had a leaky gut, insomnia and regular 18-hour migraines as well. Over-analyzing, asking myself at 4 PM – ‘will I get sleep tonight?’ was a common phenomenon. I did not like myself without make up and needed it to feel confident. It does sound exhausting right? 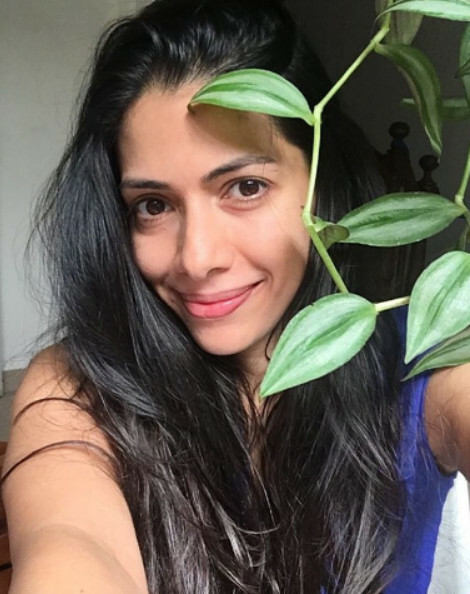 At 38, I feel alive and youthful inside out – my energy levels are fantastic and I don’t use make up at all. It’s amazing to lead such a maintenance-free and make up-free life! I sleep well and my leaky gut is under control. There is a real mental-emotional-physical blend that happens which doesn’t leave one confused on why we all are supposed to live holistically – it is indeed the most natural way. This course is putting my learnings into 10 STEPS and the course starts with proof of my pictures 9 years apart! So no surprises here – only long term, sustainable gains. 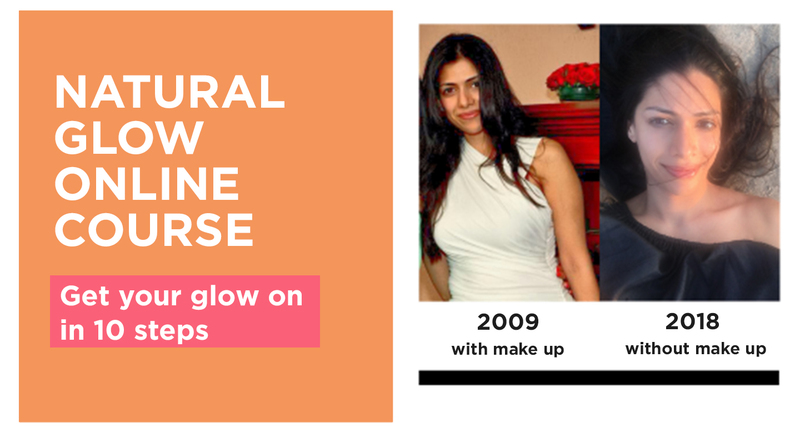 Natural Glow is my first online masterclass, curated especially for those who haven’t been able to attend my masterclasses. No more geographical and time constraints! The entire Natural Glow 10-Step Masterclass can be accessed from your easy-to-use learning platform that works on all devices, including your computer, tablet, or smart phone. The 10 steps are clearly divided into 10 chapters along with an introduction. The chapters are visual and accompanied by my voice-overs to guide you through out the course. The masterclass is fun and built to give every participant an unique tailored experience just like my onground masterclasses. You have access to your learning material for 15 days, with downloadable meal plans, recipes and techniques, so that you can refer back to the course as you begin integrating it into your life. Significance of a good morning routine has been spoken for 1000s of years – so here is one adding superfoods as well. Here we nourish the mind and the body with the best rituals and natural foods. I know this comes as a surprise! Does a shower routine bring natural glow? Hell yes! Learn this and also the ‘Tibetan Rites’ that gives Dalai Lama a natural glow at 83! We are 85% water so if one thing we need to get right is hydration. Not just by knowing the number of glasses we need to have in a day but what really absorbs the water. Yes and also are you eating water? Let’s learn that too with the glow juice recipe. By now you know that you need to learn various foods that have sugar (you will be surprised with the info here!). Knowing doesn’t mean we will live without these foods for the rest of our lives – we will be more alert and mindful and that will bring world of a difference. Get your vegetarian and non-vegetarian meal options. Yes with meal timings because there is an awesome secret that lies in doing that. We stopped making our own collagen in our body at 21 so how do you think it’s impacting our skin? What blood test should we do that will point out the important deficiencies directing us to what our body needs? Learn these essential steps here. If I think there is a more important routine than a morning routine – it is a night routine. In this night routine is also a natural skin routine which eliminates chemicals. And I can tell you for sure that if we don’t get to the bottom of this, all of the above won’t bring out our best potential. Here are simple but powerful tools that will help you to identify your attitude and how to slowly resolve it. We’ll pull it all together with actionable tips so you can enjoy your new make up free & maintenance-free lifestyle. The entire Natural Glow 10-Step Masterclass accessed from your easy-to-use learning platform that works on all devices, including your computer, tablet, or smart phone. 24/7 access to learn on your own time, at your own pace from anywhere in the world. The program is delivered via videos, downloadable PDFs and clear voice-overs to help you achieve your natural glow with ease. My first online masterclass, 10 Steps To Natural Glow, is my endeavor to make my masterclasses and coaching accessible and convenient to all at a fraction of the price. Upon registration , we will ask you to share the address at which you want your hamper to be delivered. The hamper will reach you in the next 36 hours. In the meantime, you’ll receive immediate access to the entire 10-Step course. You can go through the content on your own time for the next two weeks. At the end of two-weeks, you will receive a follow-up email from me for an update on how you’re doing, how you have integrated the course in your daily routine and what should your way forward look like. All the documents in the course are for you to download and use for reference. Somewhere in-between chasing deadlines, pursuing new hobbies, discovering beautiful places, I underwent a ‘360-degree’ transformation. I started to question my choices to find my own answers. It was a beautiful (& scary) process of unlearning what I’d learned as a student, a professional, a friend, a daughter, a woman. I was vulnerable because I knew the new direction was leading me away from everything I was familiar and comfortable with, everything I was good at! With my last stint as Vice President, Channel V, I decided to take the plunge in this new journey at a Certified Life, Health and Results Coach.